Foofy Cafe: Science and Faith's blog: Is God a Scientist? The book of Genesis tells us that mankind is created in God's image. The Science and Faith Study Group is cromprised of eight scholars, all of whom have college degrees in some branch of science. Euclid, the Greek mathematician who is most responsible for Plane Geometry, said, "The Laws of Nature are but the mathematical thoughts of God." Einstein said, "I want to know God's thoughts." And then he wrote down E = mc². 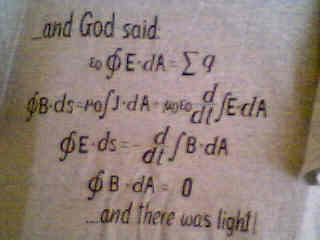 Genesis, Euclid, Einstein, Maxwell, and the clothiers at the MIT Coop all seem to agree. The Creator of the Laws of Nature was evidently a Scientist who spoke in many languages, including the language of mathematics. My belief, that God, the creator or whatever you may call that force, is the energy, that makes creation and devellopment possible, is not far from your statement, that "God" was a scientist. Like it. Everything I've ever posted on the Internet is there for the taking, to be reposted, reprinted, adapted, critiqued, improved, and evolved. Be my guest. Matter, Energy, and Information are all aspects of the same basic "stuff" that the Universe is made of.